The Durham Turfdogs are back on track. 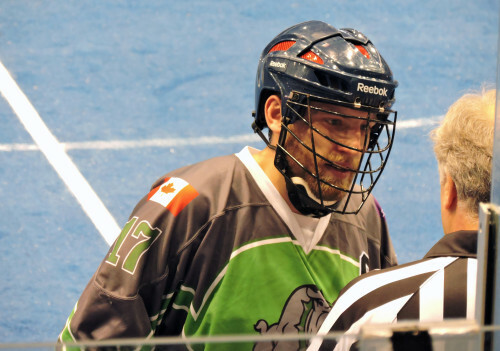 An 11-9 win over the Southwest Cyclops Friday night at the General Motors Centre in Oshawa kept the Turfdogs in the hunt for home floor advantage in the first round of the playoffs with a record of 5-3. Lucas Coote, making a second consecutive start in goal, was active with the long pass and finished the game with five helpers on the scoresheet to lead the Turfdogs. Durham has rotated three goaltenders all season, with Ryan Masters seeing the bulk of the early games and Cole Murray having a couple of outstanding relief efforts. Coote had a chance at the empty net goal late in the game but the ball went just over the net. Southwest took an early 2-0 lead on a pair of goals from Jordan Dance. Derek Hopcroft got the Turfdogs on the board at 11:34 of the first. Cody Ward gave the Cyclops a 3-1 after the first. The second quarter was all Durham as they tallied five in a row to take the lead. A pair from Cody McMahon started it off and John St. John and Dylan Goddard followed up with one each. At 8:14, with Ryan McCrory in the box for roughing, Coote made a great save and passed the ball to defenseman Mark Farthing who took the ball up floor for a shorthanded shift. A great effort from Farthing saw him rag the ball, recover it when it was jostled free by three Cyclops, take it around the Cyclops net and pass it to Josh Wasson, who flew over the crease for the goal of the game. Farthing was all smiles about the goal after the game and was happy for Wasson, a veteran Turfdog. Dance got one back for Southwest next with his hat trick goal but Goddard added his second of the game to make it 7-4 Durham at the half. The third quarter was quiet; the teams traded goals. Tim Bergin, seeing his first action for Durham in 2016, scored his first of the season, and Reed Board picked up one for Southwest. The Cyclops stormed back in the fourth, evening up the score eight all on goals from Matt Spanger, Board, and Patrick Corbett. Newcomer Brandon Armstrong put the Turfdogs back up 9-8 as accepted a pass from Mark Vradenburg while cutting to the net to beat Grant Crawley in alone. Hopcroft’s second of the game at 9:24 was the winner as he scored on a sharp angle shot. Spencer Pyke got one back for Southwest but Goddard added an insurance marker for Durham with his hat trick goal at 14:22. The Turfdogs now sit in a three way tie for first place with the Barrie Blizzard and Niagara Lock Monsters. Each team has two games remaining. The top two teams will have home floor advantage in the first playoff round. Durham surged out of the gate initially building a 3-0 record before falling in their next three. They’re currently on a two game winning streak despite losing some of their best players to either the NLL (Thomas Hoggarth, Pete Rennie) or injury (Jesse Guerin, Matt Crough). Eric Shewell, Joe Wasson, and Mike Triolo also missed Friday’s game, meaning there were some young faces in the lineup. The Turfdogs resiliency is a credit to their leaders, GM Jonas Derks, head coach Mat Giles and his assistants, and captain Mark Farthing and his assistants. Farthing points out that the Turfdogs have really come together as a team. The Ohsweken Demons lost their final regular season game to Niagara 16-6 and will finish with eight points. They’ll finish in fourth place and grab the last playoff spot. Southwest could still catch Ohsweken in points but will finish in last place by virtue of their head to head record against the Demons. Ohsweken won that season series 3-0. Farthing said his Turfdogs are preparing for the playoffs.